At least 300 students of the Federal Government Girls’ College in Efon Alaaye, Ekiti State, are hospitalised after being infected with a strange disease. According to reports, parents have already withdrawing their children from the school as news of the epidemic spread on Thursday. 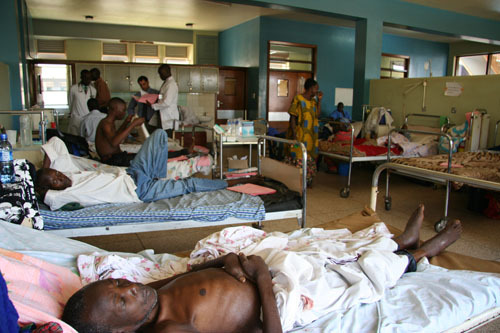 It was gathered that the diseased is suspected to be Cholera, as some of the victims have been treated and discharged, but a chunk of them are still being treated. Symptoms of the disease was said to have started manifesting on October 10, and according to the school principal, Grace Ogunyomi, the case was reported to the state government but no immediate action was taken – only routine medical attention was said to have been provided. However, the state Governor Ayodele Fayose, is said to have immediately directed the state Commissioner for Health, Dr Olurotimi Ojo, to deploy medical personnel to stop the spread of the disease. Mrs. Ojo dismissed reports that the disease is cholera, he said it was diarrhea. It was initially believed that the students’ food must have been contaminated, but it was later found that the source of the disease was not from their food. The Commissioner said, “We alerted the water corporation to chlorinate their water. They have about six boreholes and we have got them chlorinated, because we knew as professionals that the water could be a source,” he said. “We are trying to look into their environment, so that we can get where such could have broken out. We want to know how they dump their faeces and how they dump their sewage. She assured that there is no cause for alarm as government would ensure the situation is nomalised.